A few rules hardly need stating, but even so, I'll state two: If invited to a Bluegrass farm, try to go. If invited to an iconic Louisville restaurant, same thing. When an invitation arrived to attend a Lunch & Learn at Proof on Main in Louisville, the house restaurant for the also-headed-to-Lexington incomparable 21C Museum Hotel (YEA! ), I paid a lot more attention to the lunch than to the learn. I knew lunch would be interesting. 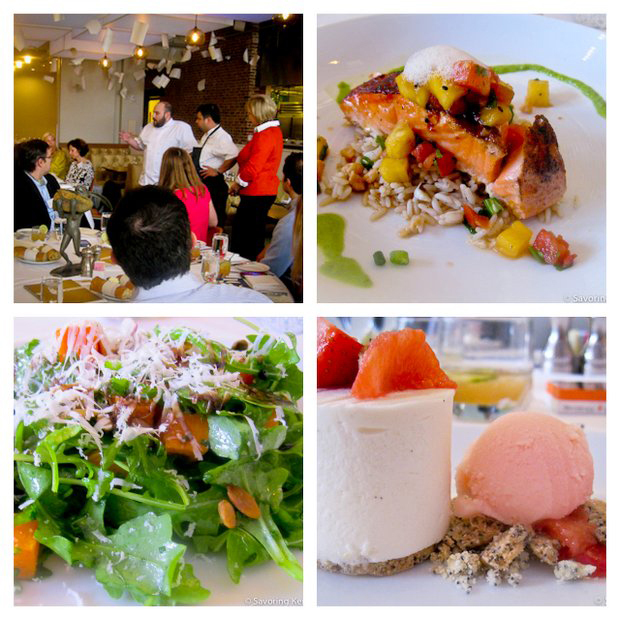 As it turned out, I discovered I have even more interest in the lunch topic than I had in the lovely butternut squash salad, Loch Duart Salmon with pineapple & Bourbon salsa, or even the yogurt honey mousse with poppy seed, strawberry & grapefruit Campari sorbet I ate that February day. Once Dominique Love described the nature and purpose of the Atlanta Food & Wine Festival, learn trumped lunch. Dominique, standing, in red, above left, is co-founder of the Festival, billed as "A four-day, culinary exploration of the South." The Festival began in 2011; the 2012 event launches on Thursday, May 10. Eat Real combines a state fair, a street-food festival, and a block party to create a celebration of good food. At the Eat Real Festival, participants learn where food comes from, who grows and makes it, and how they make it. Eat Real Festival attendance is 100% free of charge, all food at the festival costs $5 and less, and all food incorporates regionally-sourced, fabulous, and sustainably-produced ingredients. Eat Real is a social venture business with an affiliated non-profit focused on promoting and teaching food craft. Eat Real’s mission is to help revitalize regional food systems, build public awareness of and respect for the craft of making good food and to encourage the growth of American food entrepreneurs. The Food Craft Institute (FCI) is a new educational institution that works to create and improve the viability of small and medium-scale value-added food businesses in rural and urban America....Food Craft Institute seeks to reinvigorate the creation and success of artisan food craft businesses in the U.S. through a combination of food craft training courses steeped in traditional techniques along with a rigorous entrepreneurship program. See how wonderful this all sounds, how fun, and how useful to building a strong local food system and culture? I have been hoping some young, energetic, capable people will take all this on and invent just the right festival for central Kentucky. I did not expect the Atlanta Food & Wine Festival to intrigue me, really. Without knowing a thing about it, I assumed it would be an expensive place for indulging in non-local, highly stylized food and drink. There is some of that—in fact, the Festival includes a whole "Connoisseur" track that costs a lot more and offers "a more exclusive, lavish experience"— but the Festival also includes technique labs aimed at cast iron cooking and biscuit-making, along with sessions in which chefs and food experts illuminate topics like preserving, barbecue, and country ham. What is the Atlanta Food & Wine Festival? The Atlanta Food & Wine Festival is the first culinary weekend in the nation dedicated to showcasing the food and beverage traditions of the entire Southern region....The Atlanta Food & Wine Festival, a culinary experience like no other, unites leaders of their craft—barbecue pit masters, award-winning chefs and mixologists, sommeliers, fry cooks and local growers—in the spirit of celebrating the rich food and beverage traditions of the South. Tasting tents each day include more than 100 award-winning chefs and "are designed to lead guests through a culinary exploration of the South, featuring 15 themed tasting 'trails,' like Bourbon, Craft Beer, Farm Fresh, Fried Chicken, Seafood, Whole Pig...from southern regions around the globe." I particularly like the inclusion of southern regions outside the U.S. Well-known chefs around the south (or South) helped guide the 2011 Festival into being and now serve on its Advisory Council. Proof on Main chef Michael Paley (standing on the left in top left photo) and Seviche chef Anthony Lamas (standing, middle, top left photo) serve as Advisory Council members. That is why they cooked and hosted the Lunch and Learn. Chef Paley will lead a Festival seminar on preserving. The full presenter list is not yet available on the event website, but the festival schedule includes such notables as John Besh, Andrea Reusing, Matt Lee, and Sean Brock. Want to go? Here is ticket information. Take good notes! Want to create an excellent, local food-centric festival in central Kentucky? Great! Find some allies and get going. We have a lot to show, tell, and learn. Checking out the Atlanta Food & Wine Festival seems an excellent way to begin the research on what would work here. You don't get Savoring Kentucky posts by email, but you would like to, free? Here is our email subscription information.